Are you struggling to get past the beginner/intermediate stage in Chinese? Do you find it hard to get hold of good learning resources that are not for beginners? Do you feel you are restricted to talking about simple topics using simple vocab? Are you ready to take your Chinese learning to the next stage? You’ve studied some Chinese you feel like you know the basic words and phrases. Maybe you can have a simple conversation and answer simple questions. As soon as you hear Chinese people talking, it’s nothing like the textbook and too fast for you to understand. You feel completely lost and discouraged, because you still can’t follow a conversation. Everything you’ve been learning is at the beginner or low intermediate level, but you want to move on to more advanced Chinese - really understand what people are saying and be able to talk about more advanced topics. You’re not at the stage where you can just listen to the radio or just watch Chinese TV, because you can only catch a bit of what they are saying. You can find native speakers to practice with, but you find you’re always going over the same basic questions and vocabulary and you never make any progress. And to make things worse, if the other person’s English is better than your Chinese, then you end up speaking English most of the time, and your Chinese never gets any better. You feel frustrated and stuck. You feel like you’re never going to be able to understand ‘real Chinese’ at the normal speed and express yourself the way you want to. 30 in-depth conversations in Chinese (12 videos and 18 audio files), most of them around 15 mins long, on different aspects of Chinese culture. PDF transcripts of every single word in the video and audio files, with simplified/traditional Chinese characters, Pinyin pronunciation guides for all the content, and full English translations so you are guaranteed to understand every word. Complete MP3s of all the material from the videos and audio units to download and to listen to on any device, wherever you are. I think you've stumbled on a great formula here. I've listened to each of your lessons three or more times, and they are greatly improving my ability to understand unscripted native Chinese... The main reason I like this formula is because I feel immersed in the Chinese. Unlike the other formulas I've mentioned which feel like crutches, with your course I feel like I'm listening to native Chinese, which is a wonderful feeling to have after studying for more than 3 years. Because it's long and unscripted, I'm able to get a good sense of the rhythm and flow of Chinese, complete with filler words and false starts. And unlike true native content, I don't get lost nearly as easily. So it feels like the perfect stepping stone to true native content. 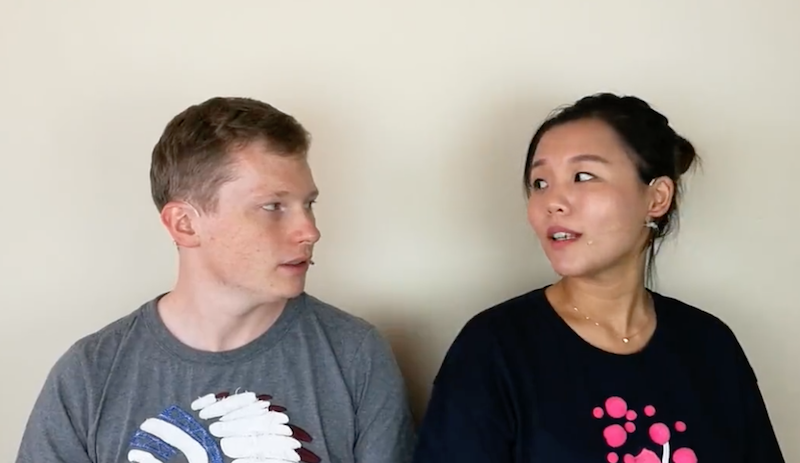 Even if you're still a beginner, you should have these 30 video and audio conversations so you can immediately start to hear clear, well-pronounced and natural conversations in order to get the "flow" of Mandarin beyond beginner phrases of "Ni hao ma" and the like. You can get lifetime access to the complete video series as you move into upper-beginner and intermediates. If you're a Fluent in Mandarin fan (and who isn't right?) then I strongly recommend you take advantage of this. You will NOT be disappointed. Most of the courses out there are beginner courses with simple language and slow Chinese. Which is fine, at the beginning. But it’s really hard to find decent and interesting materials to help you ‘bridge the gap’ and go from the simplest phrases and sentences to ‘native-like Chinese’. Most courses just stick to really boring scripted ‘learner material’, but Chinese Culture Conversations is a set of completely natural conversations in Mandarin about topics related to Chinese culture. And the best thing is that every word we say has been painstakingly transcribed into Chinese characters, Pinyin and translated into English, so you’re guaranteed to understand everything! I’ve tried to make the conversation topics as broad as possible, covering all kinds of aspects of Chinese culture, from festivals, to going to school in China, to tea and kung fu. Get to the end, and you’ll not only improve your Chinese listening, expression and vocabulary, but you’ll also find out loads about Chinese culture. You’ll even learn about cultural differences, Chinese business culture, how to be a good guest, and all kinds of things you really need to know before you go to China. Imagine the reaction from your Chinese friends or business contacts when you show how much you understand their culture, and you start talking about it in fluent Chinese! Most learners are only able to talk about the most basic things in Chinese, and these are topics that they would never be able to touch, but you’ll soon be able to handle them with ease. When I was learning Chinese, I had to figure out how to talk about these kinds of topics and it took me years to pick up all the vocabulary to do so, because this kind of material was simply not available. If only I could have had something like this back then! Most of it I could only learn years later after I got to China - but you won’t have to go through that. I don’t know of any other courses that provide anything like this - so I just had to create it myself! What's it like going to school in China? What types of Chinese food are there? What do people do for fun in China? What's it like to work in China? I wanted to let you know that I think your conversation clips are amazing - interesting, relevant (and up to date) and clear to follow. I showed them to my Mandarin tutor (who comes from Beijing, and is first generation Chinese). She is very critical of lots of internet Chinese tutors .. even Chinese Chinese tutors (!) but has told me to use all your material because its good, spoken well and it will help me, as it also supplements what she is teaching me. She thinks your conversation clips are exceptionally good - especially the later ones with Becca, as they cover everyday topics and they are up to date and you just won't cover these the way you do unless you live in China. From one student who started with ‘hello, how are you’, I think your approach is refreshing and very effective and given my tutor nearly always criticised text books, language videos, other teaching methods, but has only praise for you and your methods, I really do think you have devised a great way to learn a language. You can find Chinese podcasts all over the internet, to be sure. However, I don't know of any that are specifically geared to the intermediate level learner, with transcripts available in English, Pinyin and Chinese characters, both simplified and traditional. Your conversations are real, not scripted and contain a lot of valuable and interesting cultural information as well. They are a real "treasure trove" of useful learning materials for the intermediate or budding intermediate student. The cost was also more than reasonable. I can't imagine your time commitment having to transcribe over 90K characters and still offer the course for that price. Also, all the videos and courses that you've produced so far have been top quality and really helpful for Chinese learners, so I had no doubt this course would be too. I've seen similar comments from many others on YT. Tons of vocabulary, culture and just hearing the way a real conversation in Chinese is spoken. You begin to hear and (using the transcripts) see patterns in the language, common words that are frequently used and word order in actual sentences. And to top it off, it's all spoken at a normal speed that two Chinese speakers would use. I have picked up a lot of new vocabulary and learned a lot about China in the process. Most importantly, my listening comprehension has improved greatly. I'm now hearing individual words instead of just long run-on sentences. Pulling apart the transcripts has helped me a lot in this area. High Beginner - As a beginner looking to improve, the transcripts will allow you to make use of more advanced material. The material will be very challenging for you, but you’ll be able to understand everything because you have the translation, so you’ll make progress quicker. By listening to the audio many times, you’ll start to get used to the patterns and rhythm of Mandarin. Intermediate - The material is a real treasure trove for intermediate learners! By listening to the conversations many times without the transcripts, then with the Chinese character transcripts and translation, you’ll improve your listening ability hugely, as well as your ability to pick up and produce the tones in sentences. You’ll learn to talk about much more advanced topics than you currently can and you’ll pick up a vast range of vocabulary on loads of different areas. The material will allow you to take your Chinese ability to the next level and enjoy more ‘native’ content. Advanced - There’s so much that even advanced learners can get from this course! You might not need to rely on the translations so much. You will be able to listen to the Chinese without looking at the transcripts to take your listening to the highest level. You’ll also learn to talk about more advanced topics. The Chinese character transcripts will still be really helpful to pick up on the little subtleties and words that you’ve missed. I’ve been learning Chinese for around 10 years and I still learnt a lot of new words and expressions just from going through the transcripts! With more than 6.5 hours of real Chinese audio on so many different topics, transcriptions totalling more than 93,000 characters and full English translations, Chinese Culture Conversations is great value. Just think about the alternative ways of getting this much listening practice and exposure to real Chinese. You could go on a trip to China, but you’d have to spend maybe $1000 dollars just on the plane ticket, and then you’d also have to pay for accommodation and everything else on top of that. You could take an advanced course in person, but that would probably also cost you hundreds of dollars. Even if you could find a private tutor or friend to help you, it would be really difficult to cover all the topics in Chinese Culture Conversations. Most of what they said would go over your head and you wouldn’t have the recordings or transcripts to work on. You’re getting a lot of material, and you’re not going to find this kind of value elsewhere, so sign up now, get lifetime access to the material and start understanding real Chinese! I am going from an elementary to intermediate level, so I wanted real life material to increase my vocabulary, expressions, sentences…in addition, 30 topics on Chinese culture are a vault of information (I am curious by nature) and a good resource for small talk topics. The key differentiator was the complete transcripts. I started using many colloquial expressions, starting from nà, biru shuo, biaozhun…I also found a good training for my accent. This material will keep me busy for a while! If you’re not satisfied with Chinese Culture Conversations, just send me an email within 30 days of your purchase and I’ll cancel your account and give you a full refund. Payment is completely secure, and is handled by a major third party payment processor, not by this site. You can pay by credit or debit card. If your card is not in dollars, you will pay the equivalent amount in your local currency. There are no currency exchange fees or other charges. After payment, everything is automatic. You will receive your password by email, and get instant lifetime access to the materials across all your devices. Is this a comprehensive Chinese course? No, it’s a resource designed for high beginners up to advanced learners to help you improve your Chinese listening, speaking, grammar and vocabulary through self-study using the audio/video and transcript. It doesn’t include explanations or grammar outlines. If you are looking for a ‘spoonfed solution’ then this resource won’t be for you. I have put together a video inside the course explaining the recommended way to use the materials in detail. It is best to listen to the materials many times. 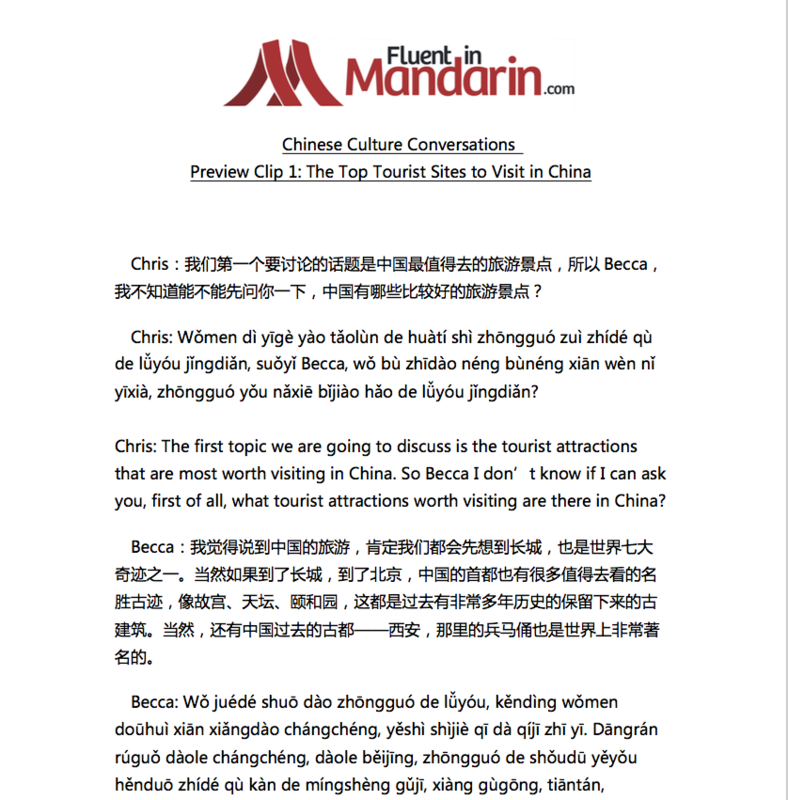 First listen to the Chinese to try to pick up ‘the gist’, then listen again multiple times, stopping and starting as often as you need to, following along with the Chinese characters/pinyin and the translation and recording new vocabulary and expressions. Why is the audio so fast / why haven't you slowed down the audio? I have deliberately tried to produce audio at ‘native speed’, so that the materials are realistic, rather than script out ‘textbook dialogues’ that are nothing like the way people really speak. Understanding is not a problem because everything is translated for you, and you can use the transcripts as a bridge to understanding much faster ‘native-like’ conversation, which will benefit your learning more in the long term. What’s the difference between this course and your other courses? This course – Chinese Culture Conversations is a listening resource for to help you improve your Chinese and break through to a higher level. It’s not for complete beginners, you’ll need to have a bit of knowledge of Chinese to benefit from it. My other course, Survive in Chinese, is a video course designed for complete beginners. It will take you from nothing up to a functional level of Chinese so that you can live or work in China. If you are a beginner, you should take Survive in Chinese. Yes, you can download the MP3s of all the conversations, and the complete transcripts in PDF format. You can print out the transcripts and transfer the content to your phone, iPad, iPhone if you wish. You cannot download the videos. The online course is compatible with any device including PC and Mac, iPhone, iPad and Android phones. If you are at a high beginner, intermediate or advanced level in Chinese, and you are looking to improve your listening, speaking, vocabulary or knowledge of Chinese culture, this course is suitable for you. For more detailed information, see above. If you are a complete beginner and haven’t learned any Chinese before, this course will not be suitable for you. It may help with HSK, but is not specifically designed for test preparation. The course includes transcripts in both simplified and traditional characters.